The Catholic funeral rite is divided into several stations, or parts, each with its own purpose. For this reason we recommend following the complete structure and making use of each station. 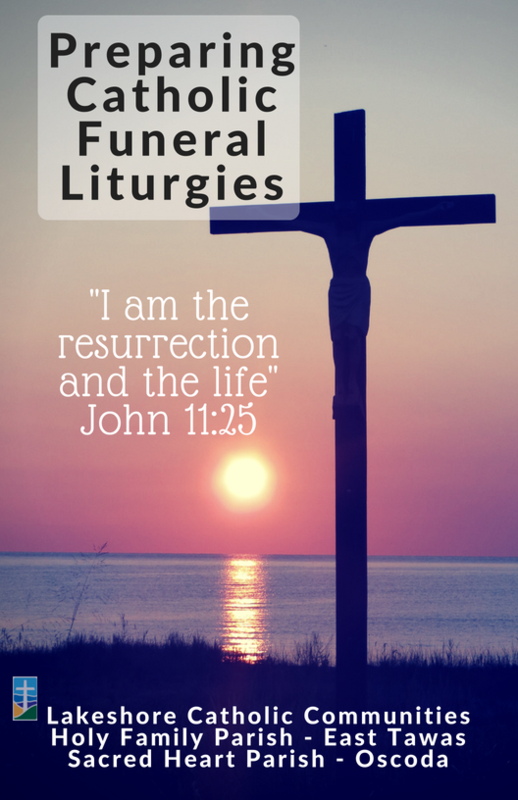 For more information regarding planning funeral liturgies CLICK HERE for our parish’s planning guide. “At the vigil, the Christian community keeps watch with the family in prayer to the God of mercy and finds strength in Christ’s presence” (Order of Christian Funerals, no. 56). The Vigil Service usually takes place during the period of visitation and viewing at the funeral home. It is a time to remember the life of the deceased and to commend him/her to God. In prayer we ask God to console us in our grief and give us strength to support one another. At the funeral liturgy, the Church gathers with the family and friends of the deceased to give praise and thanks to God for Christ’s victory over sin and death, to commend the deceased to God’s tender mercy and compassion, and to seek strength in the proclamation of the Paschal Mystery. The funeral liturgy, therefore, is an act of worship, and not merely an expression of grief.